FOOD TRUCK OWNERS: Simply click the "List My Truck" tab above and create your food truck rental profile. All inquiries on your truck will go direct to you, it's all in your hands. There is no fee to list or receive rental inquiries. Yes, it's free. 1) "View All Trucks": Simply click "view all trucks" in the search box. 2) Postal Code: You can enter a postal code and all food trucks will appear in order of proximity to that postal code. 3) Description: You can search for keywords in truck descriptions (like type of equipment, model, etc.) and we'll find all of our trucks that match your keywords. For any truck you see, simply fill out the "Contact Truck Owner" form and your inquiry will be sent directly to that truck owner. No middle man involved. 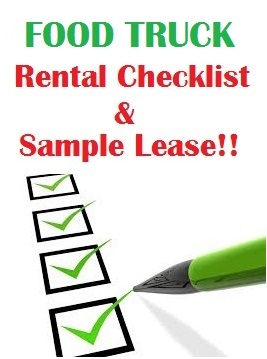 For Owners and Renters, we do supply a checklist and sample rental agreement for $99. If you're interested please visit our Rental Checklist page. -For corporate and agency clients, please Contact Us to talk through your activation / marketing campaign. We can assist and advise from start to finish if you wish to handle your promotion direct with various truck owners. Or, we can handle your activation turn-key. We're happy to talk through options.